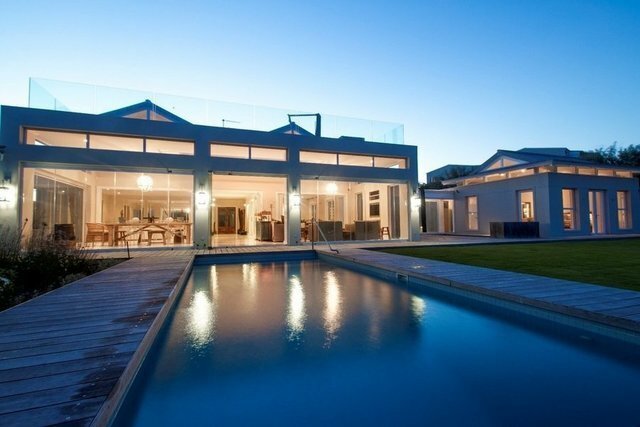 Magnificent beachfront property for sale in Plettenberg Bay. This elegant, designer home is situated in the access controlled estate of Whale Rock Beach - with panoramic views of the Indian Ocean, Tsitsikamma Mountains and Robberg Peninsula. Offering 5 en suite bedrooms, various living areas (two lounges and a family room), two dining areas and a well-appointed kitchen (with walk-in fridge) - this home is an entertainer's delight and can easily accommodate a large family or holiday guests. A self-contained flatlet is attached with another full kitchen. The entertainment areas that lead from the living rooms enjoy panoramic views and adjoin the pool areas. There are two swimming pools - both are heated. The courtyard that flows from the kitchen is another ideal entertainment area with wood-burning Pizza oven. The ground-floor glass passage creates two patios. No matter what the weather, there is always a sheltered outdoor spot where one can enjoy the outdoors without the view being compromised. Walk directly onto Robberg Beach via a boardwalk. Within walking distance to Robberg Nature Reserve and a quick drive to Plettenberg Bay's central town with all amenities.